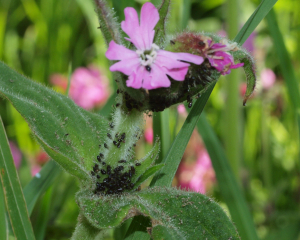 generally black or very dark aphids all on wild Red Campion - Silene dioica. some ongoing invesigation and correnspence here http://influentialpoints.com/Gallery/Brachycaudus_aphids.htm will mean I can add infortaion as it becomes available. These Aphids are VERY under-recorded in the UK and not recorded at all in Scotland until now.